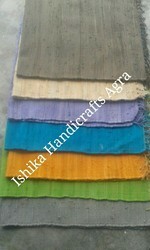 - Fine quality Chindi material used. - 100 % chindi material used. We are offering our client an excellent quality range of Cotton Chindi Rugs. These Cotton Chindi Rugs are manufactured from qualitative range of raw materials. We offer an array of Chindi Rugs (Rag Rugs) which comes in several shapes, sizes, patterns and colors. Chindi Rugs are made up with the finest quality & weave. These bath rugs are specifically made to cater the different needs of our customers. Our range is highly appreciated for its unique features like durability & quality. 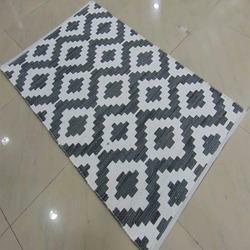 Enriched by our vast industrial experience in this business, we are involved in offering an enormous quality range of Chindi Rug. Diamonds in angrezi and barfi in our desi lingo. A special gift for a special occassion such as Holi, Deepawali etc..
Cotton Chindi rugs are available in different colour and patterns. all standard sizes are available.